The V1000 is the 10 meter (30 ft) depth housing for the SONY DCR-VX1000 & VX700 as well as Panasonic DVX102 digital camcorders. This housing that was used in many professional and indie film productions over the years with the very popular Sony VX1000 or Panasonic DVX102 cameras. Many scenes and shot were only made possible by the V1000. Designed specifically for these camcorders the model V1000 housing is manufactured from a special laminated PVC and has an integrated, optically neutral flat glass port. 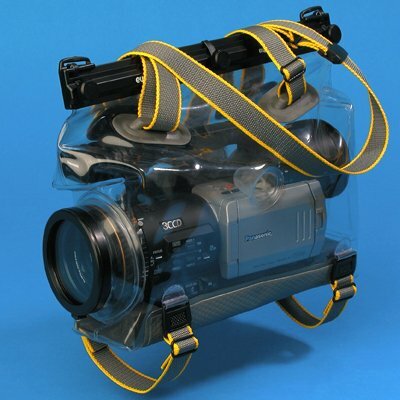 Designed specifically for "prosumer" style digital camcorders, the ewa-marine V1000 underwater housing is manufactured from our special, double laminated PVC and has an integrated, optically neutral flat glass as a front port. With this housing you will receive a CA52 adapter that fit the filter threads of the most popular lenses on the market today. By means of this adapter the camera is then docked into the housings front port, ensuring that the lens remains parallel and centered behind the front of the lens. Just as if it were a clear, neutral optical filter.